A Woman in Pieces Crossed a Sea, winner of the Patricia Clark Smith Poetry Prize, was published by West End Press in June 2014. The Telling, a book-length poem, was published by Cervena Barva Press in January 2014. Seeing Annie Sullivan, poems based on the early life of Annie Sullivan, Helen Keller’s teacher, (Cedar Hill Books) was translated into Braille and a talking book. Denise conceived and edited the anthology of urban poetry City River of Voices (West End Press). Her poetry has been wisely published, and she has been a Split This Rock Poet of the Week. The first stanza of her poem Red, about a neighborhood near a slaughterhouse, is permanently installed in a public park in Cambridge, MA. When I was a painter, around 1980, a friend took me to readings of poets whom she admired, including Dennis Brutus, Ernesto Cardinal, Denise Levertov, Adrienne Rich—an eye-opening wealth of magnificent writing. Another friend, after viewing a series of my collages, introduced me to the work of George Oppen. I used a typewriter in my studio to record notes and slowly began to write poems as I waited for the paint to dry or the gesso to set. My paintings for the most part were large, abstract, and site-bound, and I became attracted to the transferability and broader communication that poems offered. I’ve been told that my poems are often like snapshots, single framed moments. I tend to write about “spaces between,” physical and temporal and textural, and that too, I suspect, comes from a visual arts perspective. I try to set aside a block of hours every day when I’m home to enter (and stay in, that’s the hard part!) the “zone.” I have a wonderful old oak desk and on it a photo of my father looking through binoculars that reminds me to make “the distant” clear and bring it in close. Sometimes an idea, a concept, begins abstractly and through writing becomes concrete. Often the door into a poem is the need to grapple with something disturbing and enraging; those poems can stem from specific (large or small, up-front or obscure) facts. Collage, the side-by-side, concurrent arrangement of pieces, is very intriguing and as a form instigates many poems for me these days. I like the way collage engages the reader with the connections between the sections as well as with each section individually. 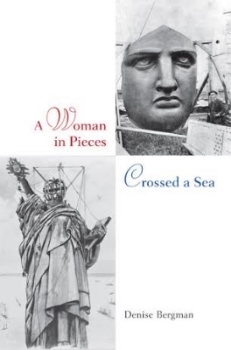 A Woman in Pieces Crossed a Sea looks at the blind belief in the symbolism of the Statue of Liberty. The writing began with two poems: one about the statue sitting in pieces on Bedloe’s Island for a year (350 pieces in 214 crates), the other poem about the Chinese Exclusion Act, which was enforced at the time of the statue’s reconstruction and unveiling (and enforced much earlier and much later). I became absorbed in the question of what constitutes a symbol and how this particular symbol would maintain its credibility when presented against a background of racism, poverty, and other prevalent injustices. I look at the statue as an aggregate of particular pieces made and assembled by laborers who also formed, shaped, constructed, dismantled, and reconstructed the steel armature and thin sheets of copper that cover the statue’s hollow core. I am very grateful to West End Press and its designer. The book won the press’s Patricia Clark Smith Award. The cover images are two that I pored over as I was writing the book. They are a perfect entry into the story, as they prepare you to see the statue as a conglomerate of parts, and immediately “dismantle” its status as an icon. A precise cut or rough edges. sketch in ink from the start. and left the pieces, unremoved, in place.